If you thought that riding on the fabled Orient Express was for other people, for the wealthy, the jet-set, for international spies and Belgian detectives, then think again. 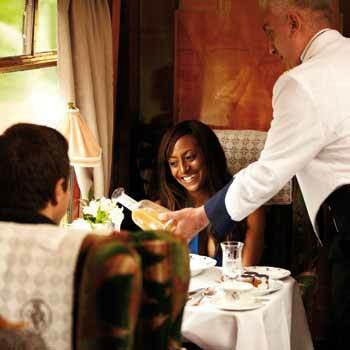 Now YOU can take a luxury journey complete with fine dining and waiter-service to die for on the Northern Belle or the British Pullman, and all without leaving the country. 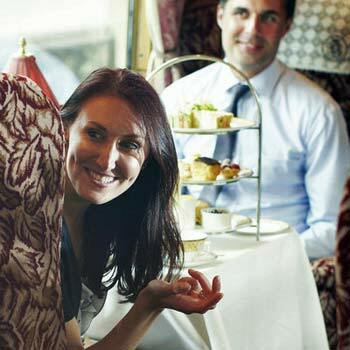 These sister trains have all the same style and panache as the original, but they operate within the UK to make accessible to all this experience of a lifetime. I should warn you, this isn’t cheap – but then you wouldn’t expect it to be, and you can rest assured that you’ll enjoy this trip so much, and treasure the memories that will live with you for a long, long time, so much that it is worth every penny. For the whole of your fantastic journey, you’ll be treated like royalty – champagne will flow, fine food will be served in abundance with grace and elegance you’d expect, and your every need will be catered for. It may not be the Royal train, but it will sure feel like it. Northern Belle or British Pullman? What’s the difference? The main difference is the stations that each train serves. 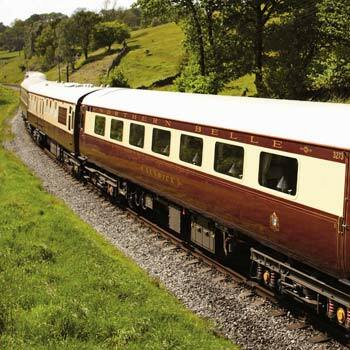 The British Pullman generally stays in the south of England, while the Northern Belle likes to travel about up into more ‘exotic’ locations like Leeds and Liverpool. This means if you want an experience from a provincial station, you’re probably best off looking at the Northern Belle. If you read the review at the bottom of the page, that’s of the Northern Belle, nut you can be sure both trains will give you the same exquisite experience. We’ve gathered all these fabulous experiences together right here for you, and our real time price checker keeps them right up to date. Just select the one you fancy and click through for the details. Some of the trips have a destination, such as a stately home, which you will be able to tour before returning to your point of origin, probably by coach. Some have shopping trips while others are round trips on the luxury train. Depending on the route there may not always be beautiful scenery to behold – even this King of Trains can’t magic up the scenery of the Alps or Venice out of the English suburbs! But the main thing is that there is so much pampering and entertainment going on inside the train that in a way it doesn’t matter too much where you actually go. The train’s the thing and your experience would be just as good if it stayed in the station and didn’t move at all! You can even take part in a Murder Mystery event on some of the trips. And while most of the journeys are pulled by diesel locomotives, you could choose to take your trip under steam power, recreating the sights, sounds and even smells of the original trains of myth and fable. Picture the plume of steam billowing back as your trusty luxury train. As with all these things though, it’ll cost you extra! If steam is more important to you, try our steam train page. In a word, everything – these luxury trips live up to their reputation and are sure to give you a day like no other, to be remembered long long after it’s over and you’ve returned to the real world. It’s an excuse to be really spoilt and waited on and made to feel really important. We certainly found nothing negative about this wonderful experience. Maybe some people would be surprised at how other passengers can get a bit giddy with all the wine and attention, but this made the atmosphere more fun. It was a Mother’s Day treat and everyone enjoyed it as such. The only thing we don’t like is the price, which means that most people can’t afford to travel in this style every week. But then if you could afford that, it wouldn’t be a special occasion, would it? That said, for such a luxury experience, the prices are surprisingly affordable and as well as treating yourself and your other half, it’s become one of the top-selling gifts to present to those celebrating anniversaries, birthdays and other special occasions. This experience is one welcomed by all ages, all kinds of people – there’s nobody we know of that doesn’t appreciate a bit of pampering and luxury, so you can be sure your gift will be well received. So when that special occasion comes up, and you’re stuck for just the right special gift idea, then you’ll need to look no further for the one that will make your recipient well and truly grateful. But of course don’t take our word for it, buy one of these fabulous trips for yourself first just to try it out and then you’ll know you’ve done the right thing. Now what better excuse for a luxury experience could you need than that? We know you’ll love it! We did. Review of the Northern Belle – what is it really like? We bought this a journey on the Orient Express as a Mother’s Day gift. Leaving from Manchester in the morning, we had a round trip around the north of England, before returning to Manchester a few hours later. From the moment we arrived (panicked and flustered after going to the wrong Manchester station first! ), the service was amazing. Immaculate staff greeted us with a smile and gave us confidence that they know what they were doing. The train had previously picked up at another station so wasn’t waiting for us – we waited on the platform as the train arrived, and gave a cheer as it approached. When the Northern Belle stopped and we got on, wow it feel special. Imagine a plush Edwardian hotel but with wheels. The overstuffed armchairs that you can sink into, the crisp white tablecloths set with finest china, the deepest of carpets, all contribute to luxury such as you’ve never seen or will see anywhere else – the luxury of a bygone age. The attentive waiting staff leapt into action, hanging up coats, plumping up cushions, pouring champagne and cheerily greeting all the passengers. As the train pulled away, we could hear musicians playing in another carriage, and sure enough, a band of musicians moved through the carriages, helping us while away the time and make this a truly unforgettable day out. You’ll be involved in merrymaking and enjoyment, but not forced into joining in. Remember, these people are professionals at giving the very best service. As the bleak Manchester scenery passed by, a magician walked into the carriage and entertained us all with slight of hand, and this made us realise that it doesn’t matter if you haven’t got the beautiful scenery of the lake district or British countryside to marvel at – there’s plenty going on in the train to keep you fascinated and entertained. The train pulled back into Manchester only 3 or 4 hours after we set off, but it felt like a whole day. With a friendly wave from the waiters and other train staff, we left chatting with new friends we had made from the train. This experience is seriously amazing. You pay plenty for it, but it’s one of the few things that we really think is actually worth it. I can’t wait to go again. . . when we’ve saved up! 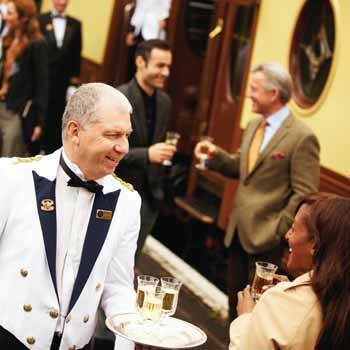 Belmond Northern Belle or British Pullman trip – THE luxury experience3.25Sarah FirminOrient Express – a luxury Edwardian hotel on wheels is probably our favourite luxury experience. You’ll have to pay a bit more than the average experience but wow it’s worth it – it’s champagne all the way!